This farm has about 10 hectares of lucerne, or 25 acres of alfalfa for the Americans. These are hay fields. They aren’t fenced and they have not been grazed. Locals would never put cows on a lucerne stand for fear of bloat, although they run cows on lucerne in other parts of the world and have a plan to mitigate it or to deal with it if it happens. As the seeding ages, the grass sets in and dilutes the lucerne. After a few years it is old enough to run as regular pasture. But before that time it makes a great source of hay! So after reading how to treat lucerne hay on the great site Hay Talk, we mowed it, tedded it and raked it ready for a neighbor to bale for us. Lucerne is a real pain. The leaves are where the goodness is and they dry fast, but the stems take ages to dry and would ruin the hay if left wet. 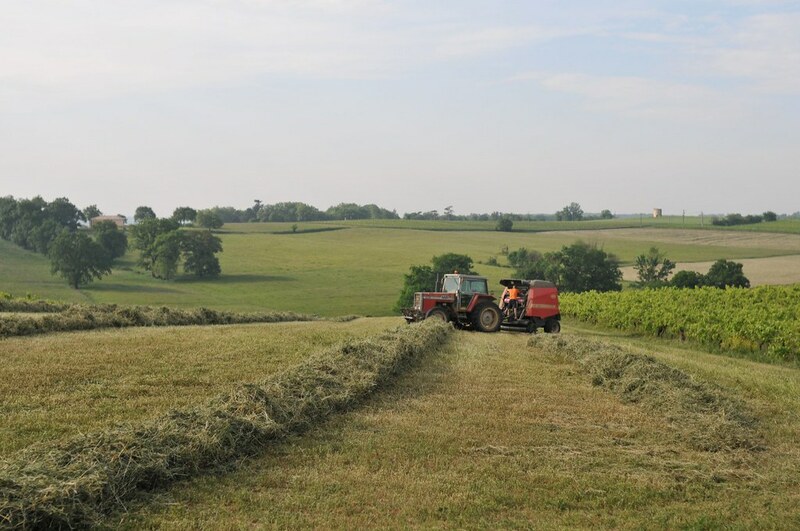 Of the 91 bales we made there are probably a few too wet and risk going moldy, and a few too dry with leaves that shattered during the baling process. We have another 30-odd hectares to seed and I think I’ll seed something that is a bit more forgiving when it comes to making hay. Didier is a neighbor who has been helping us with a few things, so when it came time to pick someone to help us with baling we went with him. He has a farm with his brother and they have so much equipment they have about one of everything. I think it is so they never make much profit and avoid paying much tax. The Southwest of France is not a big fan of Paris. 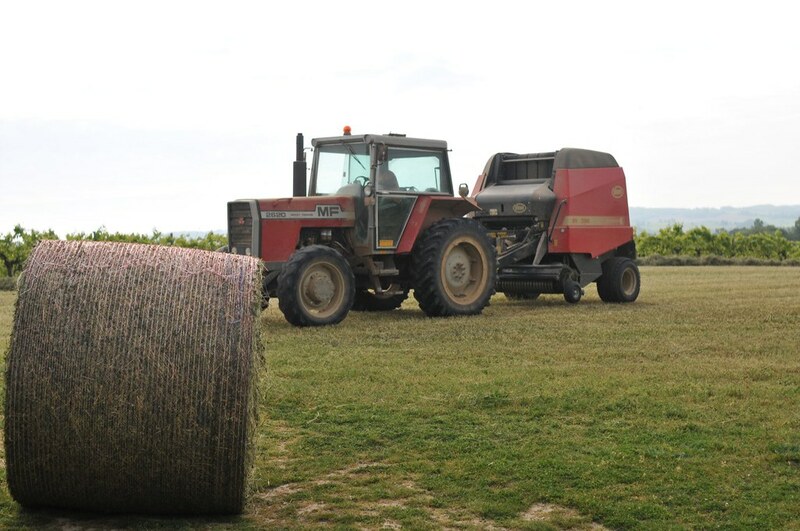 For baling he uses his old Massey-Ferguson 2620. There are two main reasons we hired someone to bale instead of doing it ourselves. 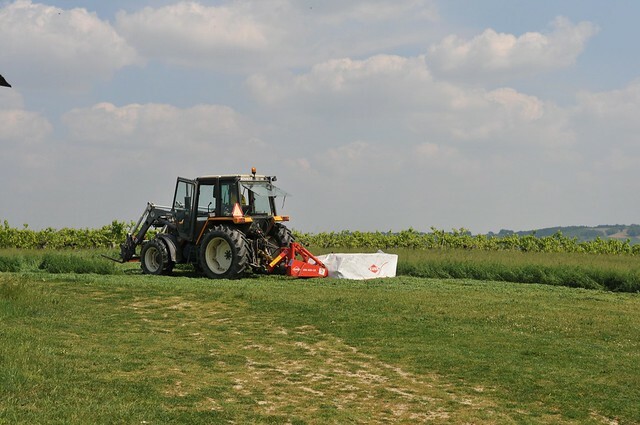 Balers are very expensive – Didier’s was about 40,000 Euros, or about twelve times what that tractor is worth. And balers break down. In the picture above Didier is messing with the parts that tie the netting around the bale. He got it to work in the end and finished off our fields last night. You can see the netting on the bale below. It keeps the bale tight and helps protect it from rain. Plus it is very easy to remove when it comes time to feed the hay to your cows. These bales will be somewhere around 300kg in weight, so 91 bales makes about 27 tonnes of hay from the 10 hectares in the first cut. I doubt we’ll be making large amounts per hectare since these hay fields are all pretty old. Folk around here expect three cuts of lucerne in a year, but we’ll probably get enough hay with two and then let the lucerne regenerate its root energy to let it last a little longer. We’ve had very little rain here for the last few months and the farmers are panicking that their sunflower and corn crops are going to fail. I’ve been playing chicken with the weather, since the weather sites all said rain was coming and having watched them promise rain all spring I just looked at the sky, took a deep breath and just mowed when I thought the lucerne was ready. 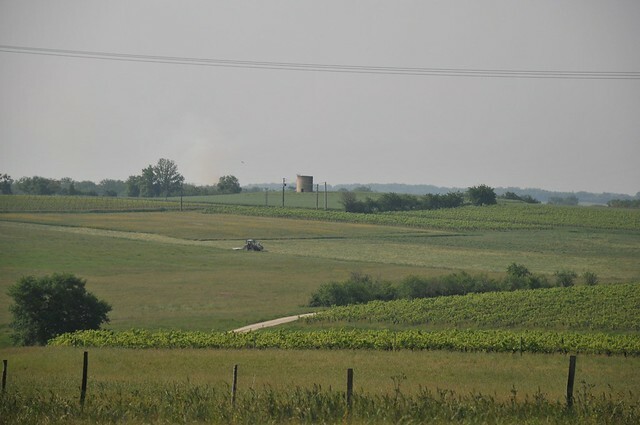 As Didier was baling the last of the hay there was a big thunderstorm approaching from the south. Lucky, I thought, we made it just in time. But the rain didn’t fall here so the crop farmers are still worried. 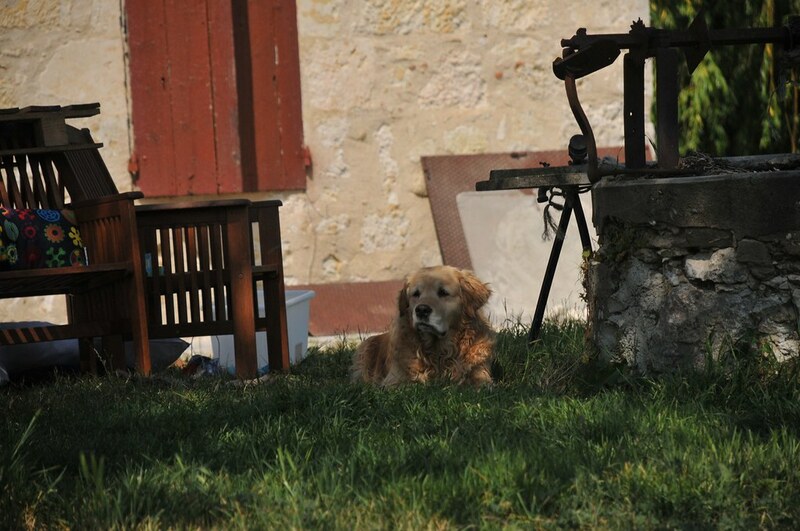 Tosca, as usual, worked hard at resting by the well. I never understand the “avoid profit so you don’t have to pay taxes” thing. How do these guys make a living? Are their wages not considered farm profit? Yeah, I don’t really get it either. Their wages are a cost so deductible for the farm but taxable as personal income. In most setups there are different accounts for the farm and for the farmer. If they’re making a, say, 40k Euro profit then they can put a chunk of that in a new tractor and effective get a tractor for half price as their marginal tax rate is somewhere around 50%. And they get to screw the government out of some tax. At least that might be how they see it. I’ve read farm accounts where they earned 118k Euros but amazingly expenses were 114k Euros. It is when cows have way too many features and become slow to install and difficult to use. You need to get him to hook you up with some cool green overalls so you can look the part when you change the oil in your car. 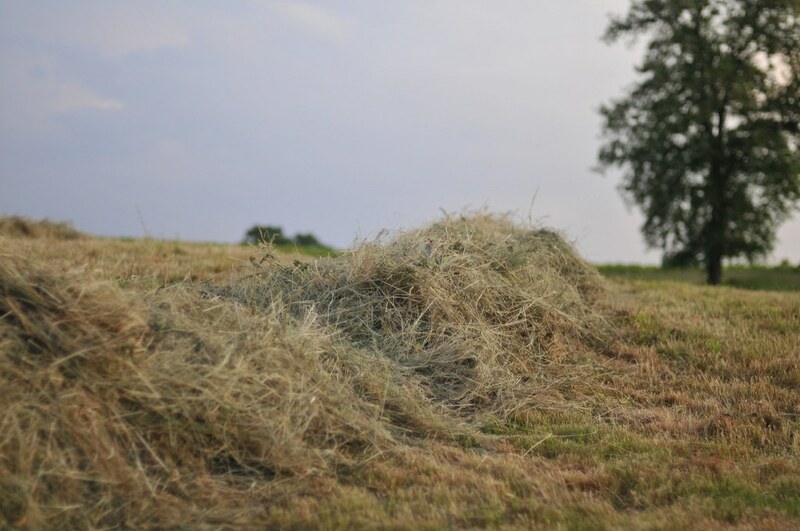 Hay is such a tricky thing and so necessary! Sounds like you all are off to a good start on your winter’s supply! I think we have enough for this winter already, but it is good to keep some extra in case of emergencies.